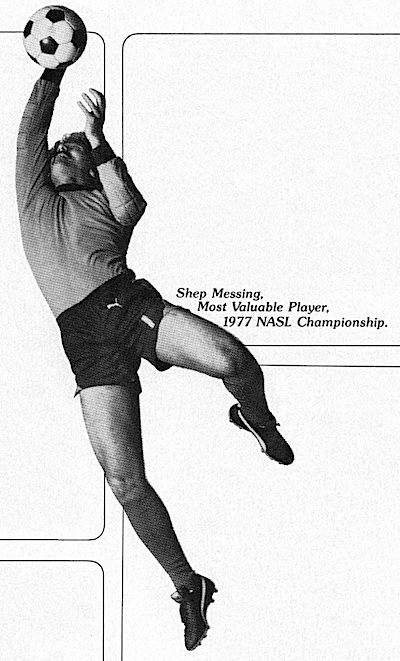 Shep Messing, Most Valuable Player, 1977 NASL Championship. The toughest thing for me as a goalie is pressure around the goal mouth. If you have a shot anywhere inside what we call the danger zone – which is a semicircle roughly 22 yards out – take the shot. Too many times, attacking teams try to get too sophisticated, too complicated. They try to walk the ball into the goal, make that one last perfect pass instead of taking the shot. Every goal counts the same. When you’ve taken your shot, follow it up. I can’t emphasize enough how many goals are scored on rebounds where you thought the goalie was going to get the ball, or the fullback … and they both blew it. Actually, the most dangerous player I face isn’t the one who simply shoots the hardest. It’s the one who also has the ability to chip the ball over my head when I come out to cut down the angle, or slip a soft shot around me into the corner of the goal. He freezes me in my tracks because I can’t be sure what he’s going to spring on me. Forwards like that give me nightmares. Go forward by going sideways. A lot of players make the game more difficult than it should be. Like getting cute and trying to dribble the ball around three defenders. If there’s a man open near you, give him the ball – even if it means passing sideways ( a square pass ). Or backwards. You’ve immediately forced the other team to adjust. Now they have to cover him. Which leaves you free to run forward and take the return pass.  Soccer is a probing game of attacking and holding, attacking and holding. Think of it that way instead of everybody charging helter-skelter down the field like they’re on their way to a fire. 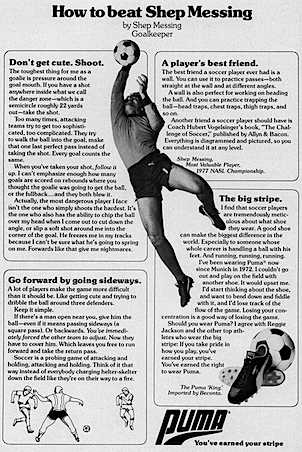 The best friend a soccer player ever had is a wall. You can use it to practice passes – both straight at the wall and at different angles. A wall is also perfect for working on heading the ball. And you can practice trapping the ball – head traps, chest traps, thigh traps, and so on. Another friend a soccer player should have is Coach Hubert Vogelsinger’s book, “The Challenge of Soccer,” published by Allyn & Bacon. 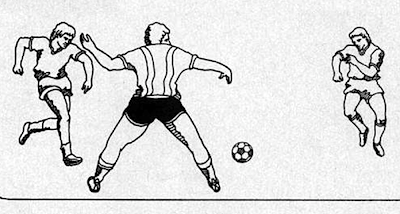 I find that soccer players are tremendously meticulous about what shoe they wear. A good shoe can make the biggest difference in the world. Especially to someone whose whole career is handling a ball with his feet. And running, running, running. 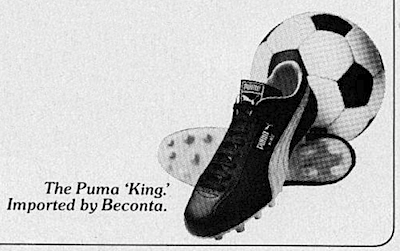 I’ve been wearing Puma now since Munich in 1972. I could’t go out and play on the field with another shoe. It would upset me. I’d start thinking about the shoe, and want to bend down and fiddle with it, and I’d lose track of the flow of the game. Losing your concentration is a good way of losing the game. Should you wear Puma? I agree with Reggie Jackson and the other top athletes who wear the big stripe: If you take pride in how you play, you’ve earned your stripe. You’ve earned the right to wear Puma.